Every case needs to be assessed on its merits. If all goes according to natures plan the size of the jaws and teeth match and you have room for 32 permanent teeth. If you have large teeth and small jaws then there will not be enough room for your wisdom teeth to erupt correctly or if they are facing the wrong way (impacted) you will have to get them removed. It is mostly the lower ones that give the most trouble but upper ones can also end up in strange places. Sometimes orthodontics in your teens will involve the removal of 4 premolar teeth leaving enough room after the rest of the teeth have been straightened. While it is possible that there is an evolutionary trend for some people not to have third molars, for most of us who have them. 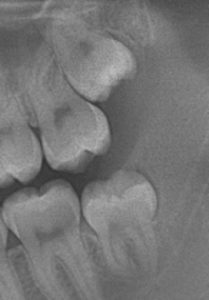 Should an Oral Surgeon remove my wisdom teeth? This depends on how difficult they are to remove. Some people prefer to have general anaesthetic during the procedure. However, some people prefer to have their wisdom teeth removed under local because they do not incur the cost of a hospital visit or an anaesthetist’s fee. In all cases, your options are explained so you are able to make an informed decision that best suits you. Healing time varies as we all differ and factors such as age and the complexity of each case has to be taken into account. What is important is that you follow the aftercare instructions we give you and keep us informed of any concerns that you have. To assist with healing avoid rinsing or spitting for the first 24 hours after tooth extraction. Meticulous oral hygiene is essential during the healing stage. Continue to brush your teeth using a soft brush avoiding the immediate area for the first 24 hours, after that brush with caution. Remember if in doubt call the surgery. Please note that smoking delays healing. Click to read my post entitled: What’s all the fuss about Wisdom Teeth?